As an avid home cook and outspoken foodie, certain things about a restaurant can really catch my attention –a menu printed daily featuring great ingredients, a functional open kitchen with an efficient system at work and a wood burning oven that serves as the cooking method for a third of the menu. Throw in owning a bakery underneath the restaurant that provides for an amazing bread basket – and I’m one happy guy. Fore Street in Portland, Maine got off to a great start for me before I even perused the daily menu. I’ve long wanted to visit, and on a recent trip to Ogunquit, we headed up to the big city to give it a shot. Fore Street splits its focus three ways – veggie based items, locally sourced meats and seafood, and things that turn out awesome when you cook them in a wood-fired oven for a few minutes. My four dining companions and I had a diverse set of tastes that allowed us to embrace all areas of the menu, while finding common areas in wonderful places like a bowl of mussels and a plate of foie gras. The appetizers were highlighted by a tangy and unique mushroom salad – finished perfectly by a delightful vinaigrette. The seafood sampler was a creative array of raw seafood items, highlighted by an eye- opening flounder tartare. From the wood-fired oven, we had the mussels, which were plump and delicious, but did suffer from the unintended consequence of the inferno – cracked shells galore. 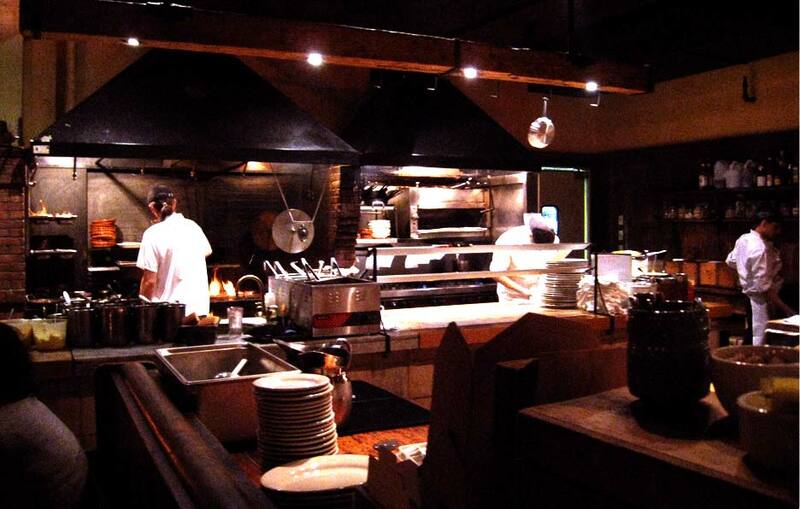 The main course is where the gem of Fore Street, and possibly all of the land-based meals in Maine, occurred. The rack of pork, a simple, thick, spit-roasted pork chop, served with sauerkraut, elicited an immediate ‘wow’ from me, along with a giggle. The strong but complex flavor, highlighted by the delightful aroma of fennel pollen, made this the second best pork chop I ever had. The first, for those scoring at home, resides at Centro Vinoteca in the West Village – try it if you haven’t, nod in agreement if you have. Other dishes included a flaky, if plain, whole black bass, and a duo of duck that featured a nicely under cooked duck breast and some delicious duck confit. We were able to order a reasonably priced Cali Cab to complement the cocktails that we started the night with, and overall, the drink menu and wine list were well created and fairly priced. Not one to do much with dessert, I was ready to call it a night, but the ladies at the table called for the closer, and out came two unbelievable desserts, a perfectly executed bread pudding and a chocolate dish so rich and divine they might have named it Oprah. For anyone visiting Maine, your first stop has to be a lobster shack (or Barnacle Billy’s) for the best lobster in the world. But if you are near Portland, and love to eat, make Fore Street your second. Mitch Wexler is an advertising exec, part-time sous chef and full-time foodie based in Hoboken, NJ. Pin It Ok. It’s a known fact that I am not a seafood fan. That said,I’ve tried a lot – almost everything put in front of me (back me up girls!). But I DRAW THE LINE HERE! This is why I like meat! A burger would not do this! 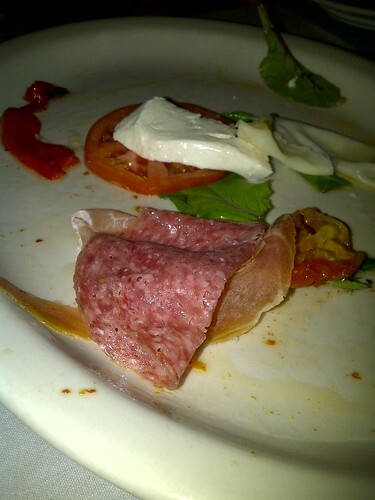 A lamb kabob would not do this! Not even the rarest steak would do this! Growing up eating your mother’s, grandmother’s or great grandmother’s traditional cooking can make almost anyone a food critic of their native country’s cuisine. Italian cuisine in particular has been so altered and modernized that few restaurants can capture the simplicity and boldness of flavors in Italy's signature dishes. So to get back to our roots (officially and unofficially), Foodies in NYC took a trip to the birthplace of Frank Sinatra and hard-crusted bread - Hoboken, New Jersey. A little less than ten years old, Café Michelina sits off of the main strip, located on Bloomfield between 4th and 5th. With several other highly palatable Italian restaurant options in the area – such as Augustino’s, Trattoria Soporito, Leos, and Piccolo Roma – Café Michellina holds its own against the competition. So after grabbing a few bottles of red wine from a nearby deli (Café Michelina is BYOB), we experienced a little bit of a wait - typical for a Friday night in Hoboken. Once seated outside on a beautiful June night, we quickly came up with four dishes we had to try – the Antipasto Michelina, Cavatelli e Broccoli, a special ravioli dish with smoked mozzarella and chicken in vodka sauce, and the Pollo alla Michelina. Even though prosciutto, salami and provolone don’t seem like a light summer nosh, the components of the antipasto were refreshingly delicious when lightly drizzled with olive oil and topped with fresh basil. The roasted peppers and homemade sundried tomatoes on the side completed the perfect bite! For the main course, all three dishes stood out for their boldness and individual flavors. The cavatelli and broccoli gave a soft and crunchy bite with the perfect amount of garlic-to-oil ratio. The ravioli were a little thicker in texture than we’d like but the vodka sauce was very tasty with the smoky, rich flavor of the mozzarella packing the punch. The chicken dish also received six thumbs up for the “zesty lemon sauce” and tender chicken and mushrooms over al dente penne. 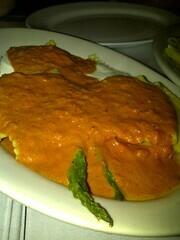 We'd swim in that pool of vodka sauce! To top off the meal, our awesome server TJ recommended we split a cannolo (Italian lesson of the day: that’s the singular of cannoli). 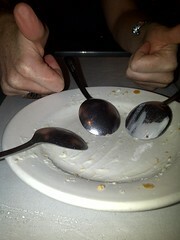 We proceeded to lick our spoons clean and (like good little foodies) did not leave one crumb behind! Comparable to Frank in NYC, this Italian restaurant offers authentic, bold flavors and hearty portions so you can carb-load for your next marathon or catch up with paesans over a delicious meal. Don’t be turned off by the old-school décor and non-flashy dining area; the food is very reasonably priced and the taste makes up for it tenfold. Just grab a bottle of wine and be ready to mangi! Boun appétito!